Fifteen minutes after the call, Hilton Botha was at Pistorius’s home in the gated, high-security community of Silver Woods Country Estate, in Pretoria, one of the country’s three capitals, 30 miles north of Johannesburg. One of the first things he saw when he walked in the door was the body of Reeva Steenkamp, a beautiful, blonde 29-year-old model and reality-TV star, who had been shot three times by Pistorius, her boyfriend of four months. “There was a lot of blood, and I saw the body at the bottom of the staircase covered in towels,” said Botha. 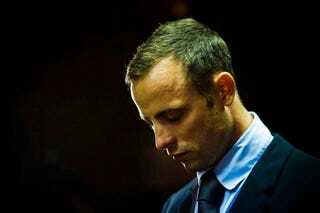 Minutes after the shooting, Pistorius had phoned the manager of the gated community, asking him to call an ambulance. Then he carried Steenkamp down the staircase from the bathroom, “her head and arms dangling,” according to a later newspaper report, and laid her on the floor. He reportedly gave her mouth-to-mouth resuscitation, and someone attempted to tie a tourniquet around her arm to stop the bleeding from one of the gunshot wounds. “She was still breathing, making a gurgling sound,” Botha recalled a witness saying. But a doctor who had rushed over from his nearby house said, “There’s head wounds—it’s not going to help,” added the detective. “And then she stopped breathing.